Designer Handbags is an ‘out of the box approach’ to making handbags. Nancy Zieman and Eileen Roche created the techniques featured to produce professional results using an embroidery machine. Designer Handbags combines Eileen’s love for machine embroidery and Nancy’s love for sewing into three cleverly designed bags. Together, the two sewing and embroidery experts will demonstrate how to create flawless bags that are full of personality and functionality. Simple to Sew! Create handbags with a flat bottom–– just 3 seams to sew! Freedom to Customize! 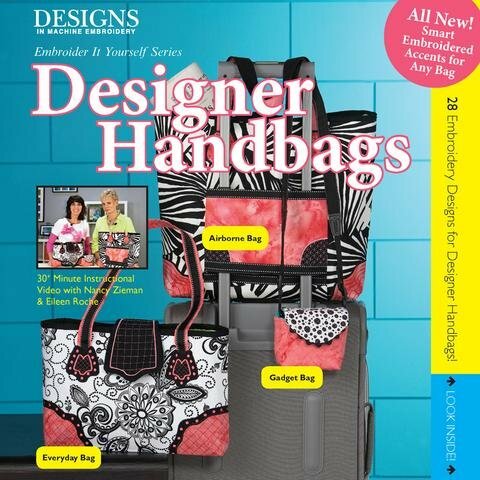 Use the bag dimensions given in this CD or choose your favorite pattern or bag template. Nancy and Eileen designed this product to ensure flawless results. Expert Sewing & Embroidery Techniques! 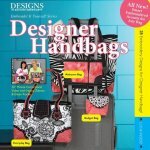 Nancy Zieman will share her exclusive Smart Pocket Technique that transforms a regular bag into an Airborne Bag. Eileen Roche demonstrates how to create straps and attach them with machine embroidery. See how corner trim designs transform a rectangle of fabric into a fashionable handbag.